NASA has selected the University of Arizona to lead the OSIRIS-REx (Origins, Spectral Interpretation, Resource Identification, Security –Regolith Explorer) sample-return mission to an asteroid. The OSIRIS-REx team is led by Dr. Michael Drake, Director of the University of Arizona's Lunar and Planetary Laboratory. NASA Goddard Space Flight Center in Greenbelt, Md. will manage the mission for NASA. Lockheed Martin will build the spacecraft. The target asteroid – named (101955) Bennu (formerly 1999 RQ36) – measures 575 meters in diameter. Bennu is a time capsule from the early solar system rich with organic compounds that may have seeded life on Earth. 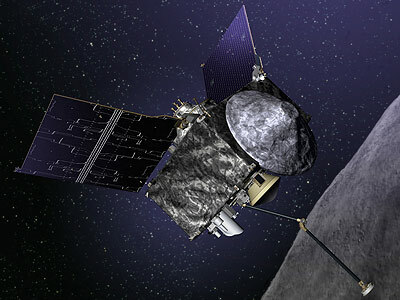 The OSIRIS-REx mission is budgeted for approximately $800 million, excluding the launch vehicle. Scheduled for launch in 2016, the OSIRIS-REx mission will return the first samples ever taken from a special type of asteroid holding clues to the origin of the solar system and likely organic molecules that may have seeded life on Earth. OSIRIS-REx will also investigate an object potentially hazardous to humanity. Bennu has a one-in-1,800 chance of impacting the Earth in the year 2182. Spending over a year exploring 1999 RQ36 before acquiring samples, OSIRIS-REx will provide geologic context essential to expanding our understanding of the asteroid-comet continuum. The mission will provide near live coverage of 1999 RQ36 operations and sample return to Earth. OSIRIS-Rex will collect a sample of 60 g to 2 kg of cometary material. The samples will return to Earth in the year 2023. The return to Earth of pristine samples with known geologic context will enable precise analyses that cannot be duplicated by spacecraft-based instruments. Pristine carbonaceous materials have never before been analyzed in laboratories on Earth. The Goddard Astrobiology Analytical Laboratory will be one of the first labs to receive the samples. the OSIRIS-REx Laser Altimeter (OLA) by the Canadian Space Agency.